Thanks for your recent patience (From most of you) I spent 5 days in China and Hong Kong and got home about an hour ago, after 15 hours of flight-time. My apologies on lack of timely notes. Having a VPN connection there (with China blocking Google) doesn't even guarantee that one can get a good connection !! But a fantastic trip, and good to be back. Today we'll address this morning's activity and service should be fine for Daily notes going forward, with Videos sent to Blog and to Private Twitter. Today's video is included given that i'm putting out a mid-day report. Energy is leading all sectors while Healthcare and Technology are both showing gains of nearly 1%. Breadth is higher today by more than 3/1 and the movement in Crude oil should be noted, as this has now gotten back up above 60 and a bullish development. Today's snapback is encouraging that prices likely will revisit prior highs and finish out the Demark exhasution counts before any reversal lower occurs. Prices managed to hold right where they needed to, as discussed in Monday's Weekly Technical Perspective, and the combination of yesterday's snapback to make a bullish close along with today's gains is a positive. 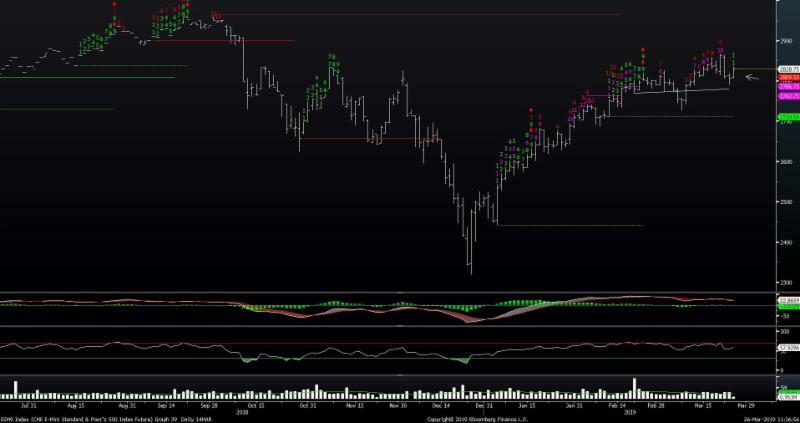 Only on a close back down under Monday's lows would this change, which is at 2785. Until/unless that happens, it's right to lean long and expect a retest of highs. Technology in particular is up nearly 1% the 3rd best performing sector today. Similar to SPX, i expect a test of highs in the S&P 500 Information Technology index, and in this case, there is substantial resistance just above that likely holds prices into April and causes a stallout. Thislevel has held going back since last August/September, so this has some importance. Look to sell gains into this area by late this week/early next. Crude oils's gains have now risen back above $60 in WTI and should be able to exceed last week's 60.39 intra-day high which would help to drive a rally back to the mid-60's. Overall, Energy should be overweighted, and specifically, stocks like COP, DVN, HES, CXO look quite positive for further gains.